Reading through the descriptions of the Man Booker longlisted novels, this one caught my eye: the book was set in southern Spain, where I would soon be heading for my holiday. There's something special about reading a book when you're in the location of its setting. So, I marked this as one of my holiday reads - and I was particularly pleased when it made the Booker shortlist. But when I started reading, my response was mixed. In fact, even as I finished the book, I was undecided and confused about my reaction. Some aspects I enjoyed; others, I didn't. 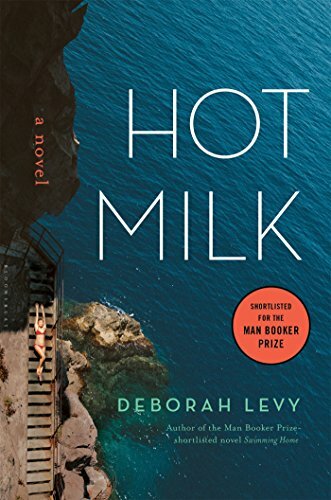 Hot Milk is the story of a young woman, Sofia, and her mother, Rose, who have traveled from England to Spain in order to attend a renowned, expensive medical clinic. Rose has trouble walking; yet, so far, doctors have been unable to give them any explanation into the reasons behind her condition. Their one remaining hope is that Dr Gomez can be the one to provide some answers. And so begins this book, which is more of a 'psychological exploration' than a story with a well-developed plot. At its core, it's a coming-of-age novel, in which Sofia is forced to examine the complicated and complex relationships with both her mother and her absent father, her own identity within her family, and her sexuality. I spent the first half of the book waiting for something to 'happen', but then realized it wasn't that kind of book. This is a novel for those who enjoy a slower, meandering pace rather than a thrilling page-turner. The writing is beautiful, almost dream-like, and it was a pleasure to read the well-crafted sentences. But I would have preferred a stronger plot - I found it too slow in parts. I also struggled to connect with the characters; instead, I found them unlikeable, or frustrating, or selfish. Hot Milk is an intelligent work, and the language is rich in symbolism and metaphors, particularly with the many references to jellyfish. I liked the fact that things weren't spelt out, and as a reader, I had to think for myself and draw my own conclusions and interpretations. It would be perfect to analyse as part of a literature class, as there's plenty of material for an essay - but it wasn't my ideal holiday read, even though I was lucky enough to read the book in southern Spain. I'll be watching closely to see if it wins the coveted Man Booker prize.